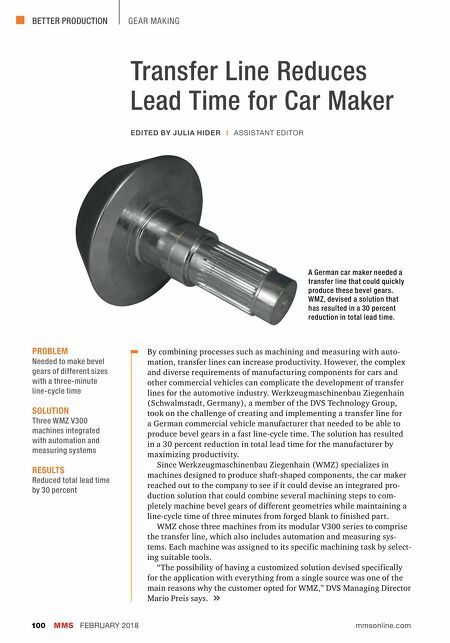 BETTER PRODUCTION MMS FEBRUARY 2018 100 mmsonline.com GE AR MAKING Transfer Line Reduces Lead Time for Car Maker By combining processes such as machining and measuring with auto- mation, transfer lines can increase productivity. However, the complex and diverse requirements of manufacturing components for cars and other commercial vehicles can complicate the development of transfer lines for the automotive industry. 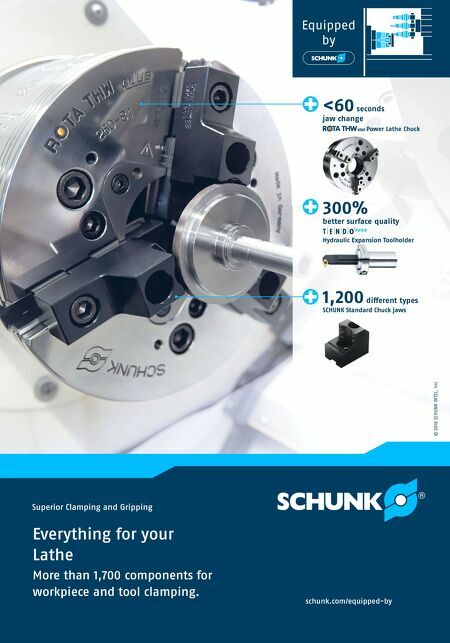 Werkzeugmaschinenbau Ziegenhain (Schwalmstadt, Germany), a member of the DVS Technology Group, took on the challenge of creating and implementing a transfer line for a German commercial vehicle manufacturer that needed to be able to produce bevel gears in a fast line-cycle time. The solution has resulted in a 30 percent reduction in total lead time for the manufacturer by maximizing productivity. Since Werkzeugmaschinenbau Ziegenhain (WMZ) specializes in machines designed to produce shaft-shaped components, the car maker reached out to the company to see if it could devise an integrated pro- duction solution that could combine several machining steps to com- pletely machine bevel gears of different geometries while maintaining a line-cycle time of three minutes from forged blank to finished part. WMZ chose three machines from its modular V300 series to comprise the transfer line, which also includes automation and measuring sys- tems. Each machine was assigned to its specific machining task by select- ing suitable tools. "The possibility of having a customized solution devised specifically for the application with everything from a single source was one of the main reasons why the customer opted for WMZ," DVS Managing Director Mario Preis says. PROBLEM Needed to make bevel gears of different sizes with a three-minute line-cycle time SOLUTION Three WMZ V300 machines integrated with automation and measuring systems RESULTS Reduced total lead time by 30 percent EDITED BY JULIA HIDER | ASSISTANT EDITOR A German car maker needed a transfer line that could quickly produce these bevel gears. WMZ, devised a solution that has resulted in a 30 percent reduction in total lead time.